VeryPDF Flipbook Maker is a powerful application which is able to convert Office to flipbook with with easy operations. This article aims at showing how to use VeryPDF Flipbook Maker to make flipbook. 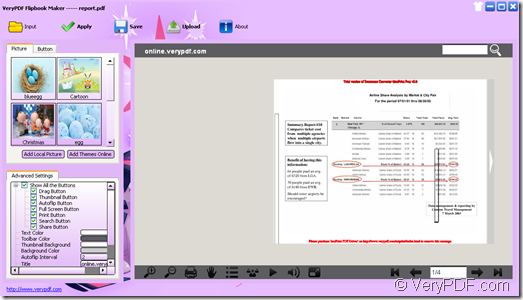 Flipbook Maker is able to convert PPT to flipbook, Excel to flipbook, etc. The created flipbook can be viewed on PC, Mac, iPad, iPhone and other mobile devices. The following contents will be the instructions about converting Office documents to flipbook. 1. Please free download VeryPDF Flipbook Maker and install it on the computer. Then please launch it. 2. In the interface of the application, you need to click Input button to open Input window in which you can check the option Input Document in Input group box. Then please choose Office document like Word, Excel or PPT from the file picker window. 3. If you need to set the page range for the created flipbook, there are two options in Page Range group box. You can convert all pages of Office document to flipbook or several pages of Office document to flipbook. 4. In Import Settings group box, the flipbook image resolution or quality can be set according to your needs. Then please click Import button. The Office document will be converted to flipbook automatically and you just need to wait for several seconds. 5. The created flipbook will be shown over the background of the user interface. If you need to change the background or flipbook button look, please try the options on the left of the interface. 6. You are able to save created flipbook as .html, .zip, .exe, .app format file via clicking Save button. Or you can directly publish the flipbooks online by clicking Upload button. Please see the user interface of VeryPDF Flipbook Maker in the next snapshot. In order to learn more information about this application or purchase it online, please visit the homepage of VeryPDF Flipbook Maker. In order to user this application for free, please free download VeryPDF Flipbook Maker. What are advantages of PDF eBooks VS traditional books? This entry was posted in Flipbook Maker and tagged Office to flipbook. Bookmark the permalink.